WooCommerce Product Table is a WordPress plugin that allows you to create searchable product tables and lists. It is officially certified as being WPML compatible. This means that you can use the world’s leading WPML multilingual plugin to translate your product tables into different languages. Note: WooCommerce Product Table also comes with several built-in languages which you can use without needing a separate multilingual plugin. Please see our article on translating WooCommerce Product Table. 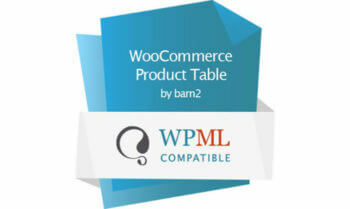 Demo site: See WooCommerce Product Table with WPML in action. Install WooCommerce, run the Setup Wizard and set up your store, including adding the products that you plan to list in a product table. Install WooCommerce Multilingual, run the Setup Wizard, and add translations for all your products, categories, etc. Install WooCommerce Product Table and create one or more product tables. Make sure you have translated all your products using the instructions in the previous section on Translating WooCommerce. The next step depends on whether you’re using one of the languages where translations are provided with WooCommerce Product Table. You can see the list of included languages at: https://barn2.co.uk/kb/translate-product-table. Included languages – Select your language under Settings > General in the WordPress dashboard, and the product table will automatically show in the correct language. In WPML > Theme and plugins localization, select either ‘Translate themes and plugins using WPML’s String Translation and always load .mo files as backup’ or ‘Don’t use String Translation to translate themes and plugins’. When you set up your product tables, DO NOT enable the caching option. This ensures that the table is loaded with the correct language products for each user, and users are not shown a cached version of the wrong language.